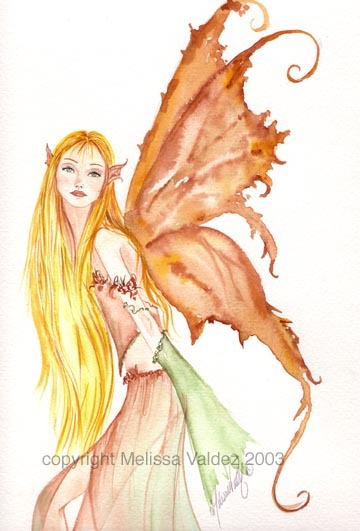 This Pixie has beeen featured in the new book "Watercolor Faeries"
oh my! I am in love with this one... she is just so solid as if she is standing there in front of me I love her wings and her hair and oh my this is just a superb piece of work! Hey!!! I saw this in Watercolor Fairies and I though it was someone else's until now. She just caught my eye and I love her face. such a sweet innocent face!! Great work Melissa.The colours are lovely.